Race (still) matters. How do we best teach this and shake up some deeply engrained beliefs about a post-racial, color-blind society? I have found one of the best ways to teach the ongoing impact of race is through the issues of surveillance and racial profiling. There are numerous tools available to combine academic research with online videos and everyday media stories that awaken students to the ongoing impacts of race. 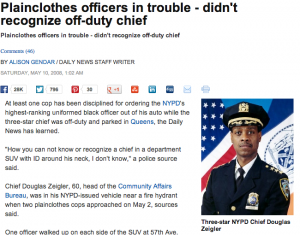 Recently, plain clothes NYC police officers did not recognize out-of-uniform, off-duty (but sitting in a department-issued SUV with an ID around his neck) three-star police chief, Douglas Zeigler. He is African American. Clearly, in the officers’ minds, his image fit closer to that of a criminal than their superior. Not even his departmental ID could alter the white officers’ belief that this 60 year-old black male was a trouble maker and not their commanding officer. They didn’t believe the ID was credible. His race trumped other credentials. Read more here. This one first came to my attention via the blog, Sociological Imagination. New York city is home to one of the most aggressive “stop and frisk” programs that encourages/requires police officers to, well it’s all in the name, stop and frisk people on the streets. Again, one’s race matters, as it seems to determine if you in fact get stopped and frisked – if you appear “suspicious”. A 2012 report states that 84% of the 1.6 million stopped in 2010-12 were African Americans and Latinos. More data is available here. This video recaptures one young person’s experience and some testimony from officers themselves. A federal judge recently declared the implementation of this program unconstitutional and may require police officers to wear cameras to document their actions. Mayor Bloomberg argues that it has made the city safer (trumping any concerns of the racial profiling). I always use this next video in class, as it generates some real gasps (a key indicator of learning) among students. While not a scientifically controlled experiment (that fact should be used as another teachable moment in class), ABC news creates a situation in a public park where different individuals attempt to steal a locked bike – a white male, a black male, and a white female. The white male is inquisitively questioned by passers-by but only one bothers to do anything beyond look completely perplexed. Take the same scene, same bike, location, and dress, but insert a young black male and within SECONDS he is confronted by people in the park, in fact a crowd gathers determined to take action. “Is that your bike?” The attractive white female actually gets assistance in cutting the lock, although the sample selection process could likely be skewed by video editing. My last example for this post is the highly publicized case of police treatment of Dr. Henry Louis Gates Jr. This case, similar to Chief Zeigler’s experience, shows that status is often not enough to overcome race. A Harvard professor, Gates had trouble getting into his own home near Harvard Square in the early afternoon when the lock became jammed. The police arrived to investigate a reported attempted break-in. One of his neighbors and the subsequently responding police assumed he was a burglar, not a frustrated homeowner. By this time Gates was already in HIS home and was able to show officers his drivers license and Harvard ID. He was still booked for disorderly conduct. 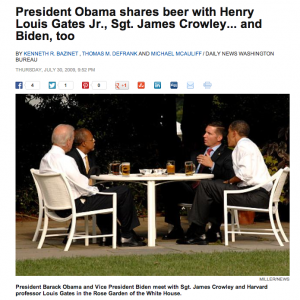 President Obama commented on the event and eventually invited the arresting officer and Dr. Gates to the White House to talk over a beer. While not harrassed by the police, Obama was once mistaken as a waiter at a party when he was actually a state senator. Race continues to matter as police officers and the general population continue to profile non-whites as more suspicious and lower status than whites. If you are white, like myself, you may not observe this occurring to others and subsequently not be aware of the additional surveillance and racial profiling that non-whites are subject too, even if they are police chiefs, Harvard professors, or state legislators. These vivid examples help us understand how racial profiling continues and we can’t rely on our individual observations or experience to make conclusions about racial groups’ collective experience in our society. This is also a good case for teaching how structure is reflected in individual action. Here we see a larger, socially-constructed racial system embedding cognitive categories in individuals’ minds, over ridding other markers of status and driving assumptions of suspicion. Ronald Weitzer has an interesting article on perceptions of police bias in three different neighborhoods in a 2000 edition of Law & Society Review. In 2005, Weitzer and Tuch wrote more about the determinants of public perception of racially biased policing in Social Forces. This article by Schidkraut adds racial profiling based on Arab appearance for counterterrorism compared to racial profiling of black drivers in a post-9/11 world. The Russell Sage Foundation has an entire working group on the issue of racial bias in policing with numerous resources. This article in the Journal of Personality and Social Psychology by Eberhart, Goff, Purdie, and Davies investigates the visual processing that underlies racial bias and crime. I will leave you with a positive note. Due to legal enforcement, it is getting easier for non-whites to catch a cab in NYC. – Teach well. It matters. 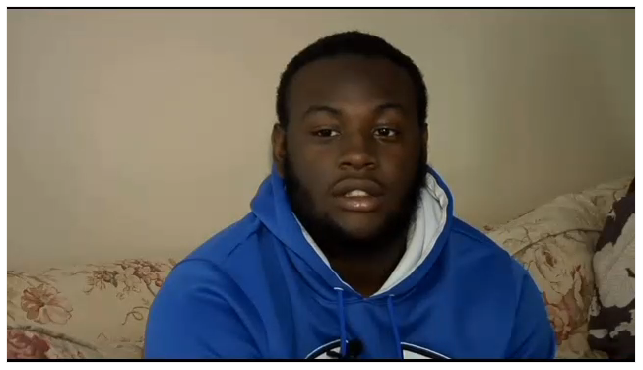 Recently a black teen in North Carolina was handcuffed and pepper sprayed in his own home after White neighbors called the police upon seeing him enter the home. DeShawn Currie, an 18 year-old Black male, is the foster son of an all White family. After returning home from school, he went downstairs to investigate noises only to find police with their guns drawn and pointed at him. He tried to explain but the police were not convinced. His frustration grew and the police eventually handcuffed and pepper sprayed him. It was reported that one of the officers pointed to the photos on the mantle of the family’s three White children as evidence that he did not belong there. 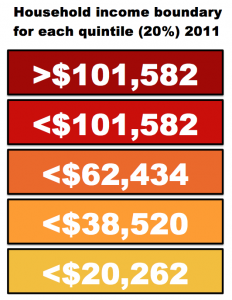 I usually begin class by drawing five stacked layers (rectangles) representing each income quintile, but I leave off the income amounts that distinguish each level. I usually have to take a minute to explain the idea of a quintile and that each block represents 20% of the total population of households (in this case). When explaining this, be sure to note whether the data you are presenting is individual or household levels and income or wealth. 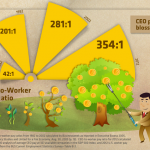 Most of the time, because of available data, I focus on household income. 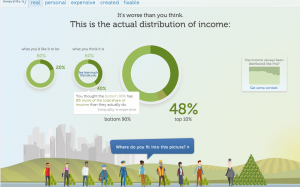 More than just an understanding of the levels of stratification of income in the US, this activity demonstrates to the students that our individual assumptions about the state of society can (and maybe even often) differ from empirical facts (what I like to refer to as reality). Plus, showing students how wrong their assumptions are reminds them that they are learning something in your class (this may be worth pointing out on occasion just in case there is doubt). 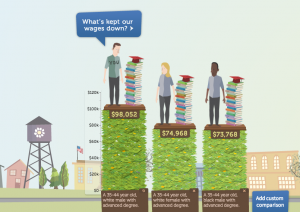 I usually start at the top, “What’s the minimum level of annual income that places a US household in the top 20%?” The initial guesses by students usually land between $200,000 and $350,000, occasionally as high a half million. 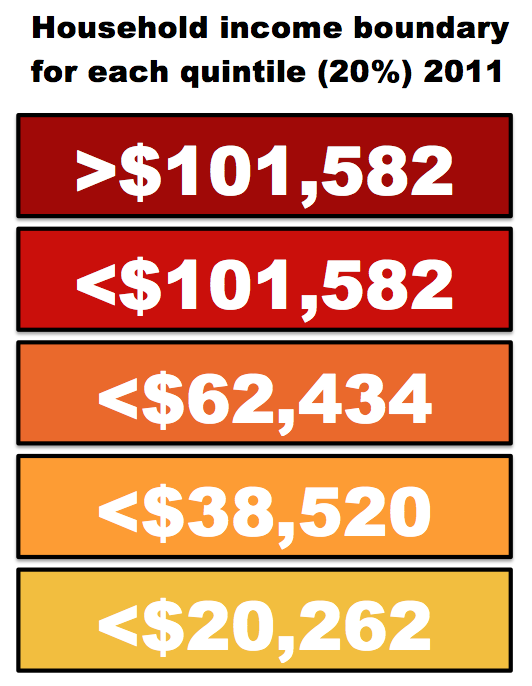 The REALITY is that a household income of just over $100,000 places one in the top 20% (in 2011 dollars). 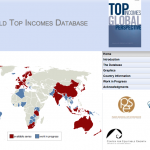 An income of $186,000 or more places a household in the top 5%. Check here for the most up-to-date numbers from the US Census. 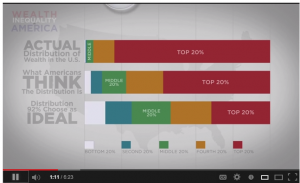 A previous post linked to a good visualization of the income inequality in the US asked individual viewers to indicate what they thought it should be and what they thought it was, but unlike the video featured in this post, it did not show collectively what individuals thought it should be and actually is. 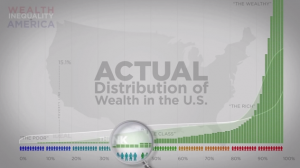 “What does everyone else predict?” Another difference is that this resource primarily looks at the distribution of wealth, although it jumps to income occasionally (encourage your students to watch with a critical eye because, although correlated, there is a difference between wealth and annual income). “Income Inequality in the United States 1913-1998” by Thomas Piektty and Emmanuel Saez in The Quarterly Journal of Economics (find their tables and figures in Excel here). By the way, this article has been cited over 1400 times since 2003. Often we are not consciously aware of the prevailing social norms that dominate our culture until they are violated. Many faculty demonstrate the power of social norms to their students with an assignment for them to engage in norm violations – intentionally altering their behavior outside of the classroom to see how others react and how it disrupts social interaction. The risk of this assignment is that students take the norm violation too far, harming others or getting in trouble (try explaining to the Dean that you actually assigned them to do that). Therefore, rules and guidelines must be made clear if this is assigned. Due to the risks, I tend to enact or discuss examples in class – facing the “wrong” way in a full elevator, acting like a crazed football fan at an opera (including bringing one of those big foam number-one hands), wearing a tuxedo to class, what it means to “act white”, doing gender, etc. One of the most effective and funniest examples I have found that has also received good response from students involves the use of cell phones in public. 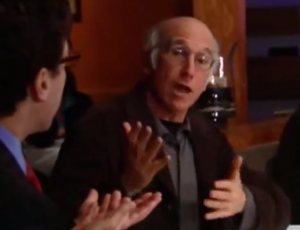 A clip from Larry David’s television show Curb Your Enthusiasm clearly demonstrates that the norms around cell phone use in public remain in flux as the technology becomes increasing pervasive in our individual and social lives. 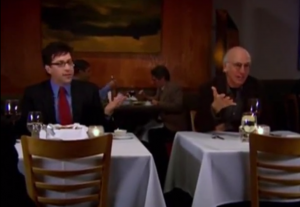 The clip shows Larry trying to enjoy a meal alone in restaurant. Someone on a Bluetooth headset next to him interrupts his experience by yapping away. I’ll let you watch the rest. While not of great social significance, this norm violation is a good way to begin the discussion, generate laughter (which refreshes students’ attention), and demonstrate the social processes of norm enforcement. From here, you can make the leap to the power of social norms of more consequence. *A note of warning, if you are not comfortable with cussing making an occasional appearance in your classroom, you will not want to use this f#@king clip. 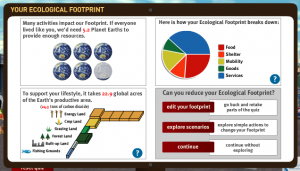 ECOLOGICAL FOOTPRINTS: How many planets for our lifestyle? As the consequences of highly consumptive capitalism continue to cause problems around the world, teaching about the impacts of our consumption is an increasing necessity in every classroom. One of the best ways I have found to demonstrate the structure/agency dynamic to students is to have them calculate their ecological footprint. Formulated by Dr. Mathis Wackernagel and his team at the Global Footprint Network, this interactive online tool allows individuals to enter specific practices of their individual consumption such as: the quantity of meat in their diet, the proximity of the sources of their food, the amount of trash they generate, frequency of purchasing clothing and household goods, size of residence, and modes of transportation. There are two options for reporting individual characteristics and I require my students to do the more specific reporting method. Upon completing the dozen or so questions, the website calculates the number of planets it would take for the individual’s consumption to be aligned with the generative bio-capacity of the earth. For Americans this is almost always in the range of 5 or 6 planets and of course we only have one. 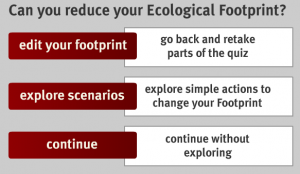 Additional tools allow for the exploration of reducing your overall footprint. As usual, I try to utilize resources in the classroom that have an explanation of their methods and data. This one is no exception as it contains both a brief summary and much more extensive documents. 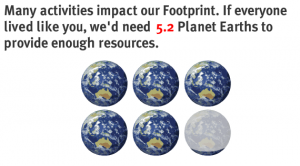 Click here to check out their methods section.In case students doubt that humanity is consuming the earth faster than it can produce new resources or filter our waste, the site also publishes a free Living Planet Report that can be downloaded or viewed dynamically online. Take the quiz and see how big your ecological footprint is. 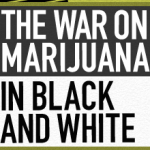 The war on drugs impacts people differently based on race. The rate of drug use among populations does not correspond to the rate of incarceration for drug use. Many students often assume that the higher rate of African American males in US prisons is simply a reflection of higher rates of crime. After all, it is called the justice system. 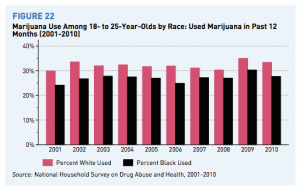 An extensive report by the ACLU provides a short video, graphic presentations of the data, and a pdf of the full report on marijuana use and arrest rates among blacks and whites. The results demonstrate that drug use and arrest rates are not correlated. In fact, in 2010 blacks were nearly four times as likely to be arrested for marijuana possession as whites nationwide despite reporting very similar rates of use (within 1 – 2.5%). The rates of use among 18-25 year olds from 2001-2010, show consistently higher rates of use by whites (2 – 5% higher). Looking at those who report never having smoked pot, blacks report higher levels (of non-use) than whites. Moving beyond empirical reporting to theoretical explanations the report references relevant sociological research such as Sampson and Raudenbush’s 2004 article in Social Psychology Quarterly. This material is an excellent resource for a criminology, deviance, or race section of any course. The full report (nearly 200 pages) has more extensive explanations of the multiple sources of data that were used and the rationale behind simplifying the race categories to black and white. 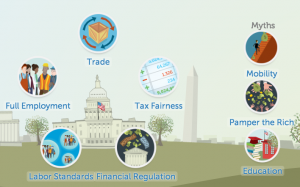 The macro data is supplemented with a few personalized vignettes that individualize the larger social consequences – something I have found helps students more fully comprehend any issue. 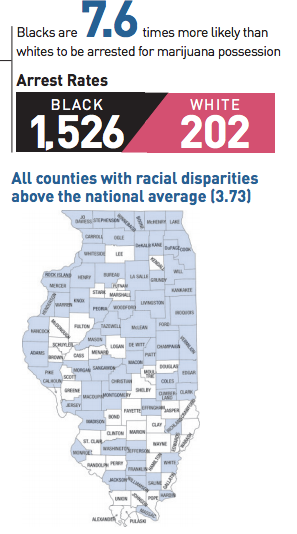 The full report (which is free to download) ends with a state by state analysis of arrest rates by race, expenditures on enforcing laws against marijuana, and a map showing counties that exceed the national average in the racial disparity of arrests. These individual state reports allow students to see the issue from a national and more local level. 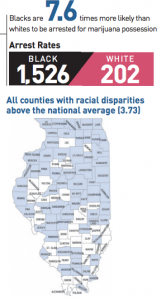 “Here is the situation nationally in the US, how does our county compare?” The state by state reports also contain pie charts showing the percentage of all drug related arrests that are for marijuana possession. With all the graphs in the report it could easily be used as an example in a quantitative methods course or some of the figures could be extracted to test the students’ quantitative literacy in reading charts and graphs. Deviance is socially constructed and the policing of certain types of deviance have real consequences for people. Additionally, that policing continues to impact African Americans more than whites despite similar rates of, in this case, marijuana use. 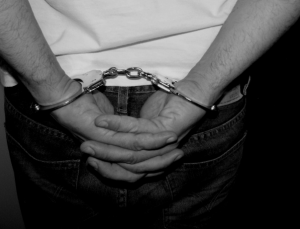 Students may believe that being if you are arrested that means you were violating the law. 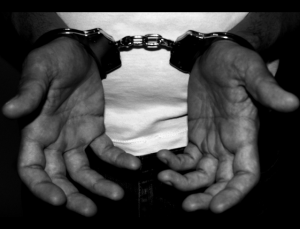 Arrests have more to do with the presence of police in the community, the public nature of some communities socializing versus the private nature of others, and who is suspected of being criminal.